Last week I started to notice Brayden was getting a little too attached to the television. He wasn’t getting more TV than usual, but he was desiring it more than usual. I was concerned over this because he was even wanting to watch TV over playing outside, which is an absolute first in his life. Around the same time, he had a breakdown. He was not obeying well and started crying. I told him he needed to listen to Mommy. I explained that if he did not stop and obey Mommy, he would lose his TV privileges for three days. Three days is a long time, but I was wanting some major detox for him and this opportunity presented itself :). He didn’t stop crying and the TV was not allowed on for three days. He has been good as gold ever since. I attribute this to a couple of things. One is that the TV can really contribute to behavior problems. All he watches is PBS, but it is easily addictive for him. So less TV is good for him (see this post for more TV thoughts). Another is that since he likes television so much, it is his “currency.” It is something that works well to take away as a privilege if needed. I have since shortened his daily TV time. As a note, I have discovered one reason he was preferring TV over going outside. Our normal outside time is after lunch. Around here, it has gotten to be too hot right after lunch in the last couple of weeks. So I evaluated the schedule and have changed our outside time to right after breakfast. He is loving it now. That is another post topic all together! Something to take from this is to know what works for your children when it comes to discipline. Also, don’t be afraid to do what works. If taking a favorite toy away is what works, do it if needed. Everyone has currency. Previous Post Poll Results: What was/is baby’s approximate optimal waketime length for ages 4-5 Months? (waketime length includes feeding time)? Do you have any suggestions on how much time your child should spend with the grandparents? My child does great at my parents’ house, takes her naps, eats well, sleeps all night. At my mother in law’s house, she does not lay her down when i ask, lets her snack in between meals and does not respect my parenting. Thanks for your input!! need advice!! !sara is 25 weeks today. up until the last 2 or so weeks she was taking naps from 8-10am, @12-2pm, a 30-45 min nap around 330 or 4 then bed time at 7p. she would wake once or twice but that is all time wake time @645am. (eat 630, 1030, 230, 630 with solids offered but rarely eating more than a few bites). NOW she naps form 8-9 then is whiny, tired and down @ 11am till 12 then by 3p is exhausted and usually goes back down for around 45 min. then at night she has been waking multiple times. my mom keeps her for me at her business office in their conference room (baby bed to nap) and has followed BW for me but cannot let her CIO for very long durign naps. i am so frustrated. she was doing so well and now the last few weeks have been awful. i have offered her extra feedings thinking it was a growth spurt but she is rarely interested. should i let her just CIO at night? she is taking the pacy and i started the last couple nights to only give it to her intially when she goes to bed. still BF do you think my milk is not satisfying her? i work and have to pump and during the week only get to BF her at 630pm. i need advice on how to get her back on a schedule!!!! any suggestions… is 6 months a querky time for them? she can roll over both ways and sit a little bit alone but looses balance when moving side to side. she wants to be held and entertained all the time!! is this normal for 6 months?any advice is welcomed!!!!! 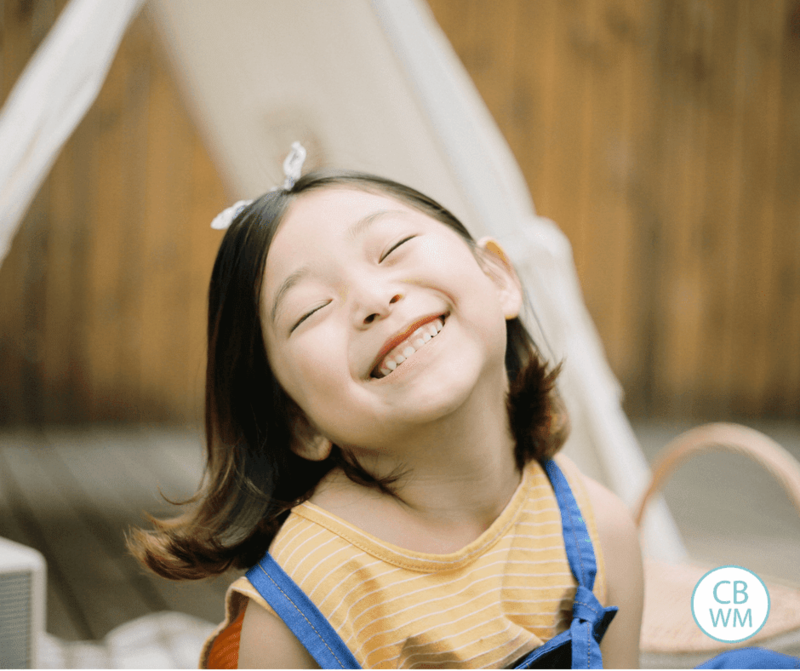 Christie,My parents and in-laws are both very compliant with our schedule, but my kids still come back and need some readjusting. Part of the role of granparents is to spoil, so that is just something for everyone to get used to.At the same time, they should respect certain things. I think naps and bedtime should be respected. Making sure healthy meals are eaten should be respected.How you handle this will depend on the age of your child. My parents are more lenient with my 3 year old than my 15 month old, which I think is appropriate. It also depends on how long they are with the grandparents. If it is for a couple of hours, it can be fixed. The 3 year old can adjust more easily. My in-laws just watched my kids this Friday night. I told them Brayden could go down at 9 for bed (usually 8/8:30 sometimes) and Kaitlyn by 8 if she was still happy (usually 7:30). The younger the child, the less flexible they are. I would talk to your in-laws and explain the importance of naps for your daughter. Tell them (as nicely as you can) essentially that you ask her to respect your parenting decisions. If she can’t be trusted, then she can’t be alone with your child. It is a situation where both parties need to give, but I think Grandparents should respect the wishes of the parents. 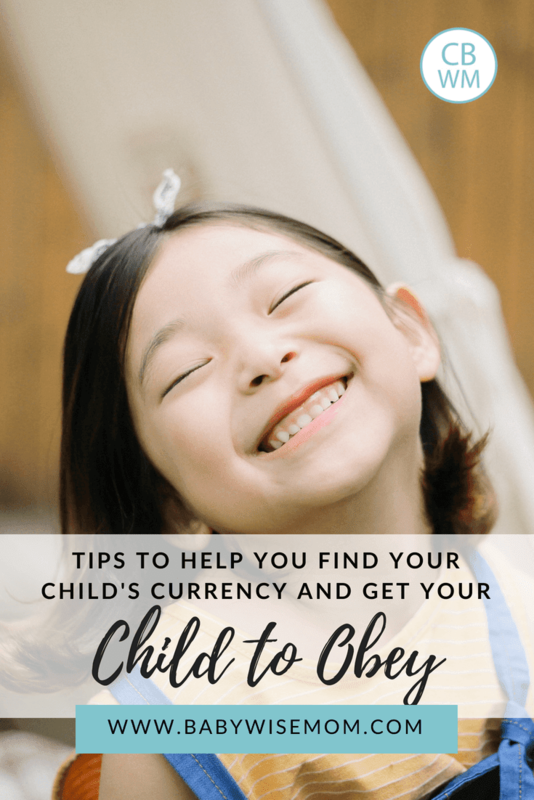 Jenny,I will add it to my list of posts to do for sure.A good point in finding currency is to find something that works for your child and you. If you don't want to take it, then you will be less hesitant to do so. The child will realize that very quickly.However, keep in mind that if it is the right currency, it shouldn't be something you have to do over and over and over and over…I have a post somewhere on this blog that discusses a strange currency of Brayden's, and that is his clock. When he was getting out of bed over and over for naps at about 3.5 years old, I would take away TV, but it didn't help long-term. Finally I removed the clock. That was the end of the world to him! It also fixed the nap problems long term. I never suspected the clock to be his currency. The eye contact thing is strange behavior for our culture. I would start by trying to get it naturally just by looking him in the eye during happy times (reading, hugging, talking, cuddling) and give it lots of positive association. I don't think it is an age thing.Evaluate why. Does he seem uncomfortable with it? Is it just that he is distracted by other things? Once you can better guess the reason for it, you can better treat it. If it is discomfort, you want to change his association for it. If it is distraction, you want to work on his focussing skills.